Shipwrecked wine: Does it taste better than cellared wine? The most famous shipwreck is arguably The Titanic which sank with the loss of 1500 lives in April 1912. As befitting a liner of sumptuous luxury it was packed with fine foods and wines. First class passengers certainly enjoyed lavish, multi-course dinners. Menus recovered from the ship indicate that 10 courses were the norm, each dish paired with wine. 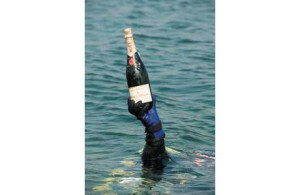 Corks that survived the sinking later identified Champagne selections including Moët and Heidsieck & Co.
1,000 bottles of wine were listed in the liner’s manifest but did any of them survive? 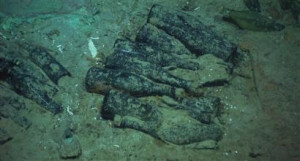 Several bottles of champagne were recovered during expeditions to the wreck in the mid 1990’s, most still containing champagne. During a 10-course dinner at the Hong Kong luxury hotel Hullet House in 2012, guests got a taste of one of the Titanic’s own sparkling wines, a recovered vintage 1907 Heidsieck & Co. Monopole bought by the hotel for $11,000. (The dinner, based on a menu from the Titanic’s first-class dining room, cost just under $2,000 per person.) Rumour has it the Champagne tasted great. However in 2010 bottles over 200 years old were found in a shipwreck in the Baltic Sea. Sometime between 1825 and 1830, a cargo galley sank with more than 150 bottles of champagne from different brands on board. On close examination of the cargo, the oldest known vintages of Veuve Clicquot, Heidsieck & Co. Monopole and Juglar (which had ceased production as an independent entity in 1829) were discovered. A champagne expert stated that the Heidsieck had been kept under good conditions, contained around 75% Pinot Noir and had floral and lightly toasted notes. It was estimated the bottles could be worth up to €100,000 each. The 1907 Heidsieck & Co.Monopole Diamant Bleu “Shipwrecked” Champagne. Most bottles had already been sold at auction, but there were still ten bottles for sale at the Ritz Carlton in Moscow, priced at $35,000 each. So can shipwrecked wine really taste better than cellared wine? A trio of French wine lovers - a vineyard manager, a barrel maker and an oyster farmer – teamed up to find out. Winemaker Bruno Lemoine had two small 56-litre wooden barrels built in order to age his red wine by an extra six months. They were strictly identical for the purpose of the experiment and were then filled with a 2009 vintage of his Chateau Larrivet Haut-Brion. Barrels of the Bordeaux wine were stored in two locations - one was to be kept in chateau cellars (dubbed ‘Tellus’ after the Roman goddess of the land), the other sunk among the oyster beds of the Bay of Arcachon, on the Atlantic coast (named ‘Neptune’ after the sea god). Both barrels were retrieved six months later for the wine to be bottled, tasted and analysed in a laboratory. Tellus turned out to be quite disappointing, while Neptune was far better tasting than had been expected. 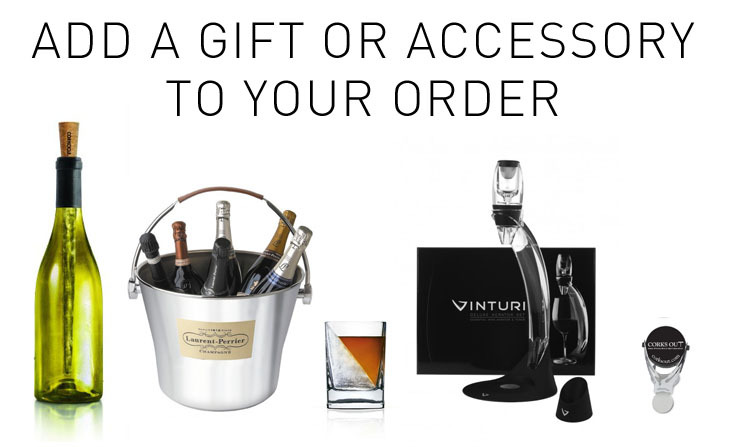 Despite being sealed with a watertight stainless steel plug, the wine was subtly changed by its ocean environment through a process of osmosis. And while the wine had lost some of its alcohol content, its sodium concentration had risen, adding a subtle salty note, bringing out the best of the tannins. Sampling wines from these shipwrecks offers the chance to taste the prehistory of today’s wine-making styles. It is a wonderfully poetic form of time travel; a tangible, emotional and spiritual link with the past. A chance to sample the wine of a doomed voyage is one not to be missed.